Jenny Boucek took over as Storm head coach in 2015. Photo by Neil Enns/Storm Photos. 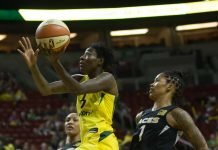 After dropping the first four games of a key five-game road trip, the Seattle Storm have made a change at the top. Out after two-plus seasons is head coach Jenny Boucek, who will be immediately replaced by assistant Gary Kloppenburg, on an interim basis. Expectations were high for the Storm entering the season, and team started hot, winning four of its first five games. But since then, they’ve gone just 6-15, with nine of those losses by nine points or less. 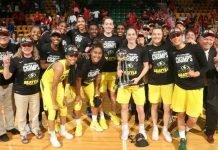 Boucek finishes her Seattle tenure with a record of 36-58 since taking over as head coach in 2015. She joined the franchise in 2010, where she was an assistant coach on Brian Agler’s staff until his departure in 2015. 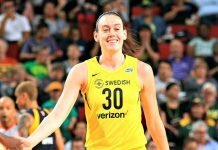 She was a Storm assistant coach from 2003-2005, in the Anne Donovan era, and has served as an assistant coach for the Washington Mystics and the Miami Sol. Boucek was head coach of the Sacramento Monarchs from 2007-2009. Kloppenburg was an assistant coach for the Storm during the Lin Dunn era, and has also assisted for the Los Angeles Sparks and Indiana Fever. He was head coach of the Tulsa Shock in 2012 and 2013. He will be tasked with guiding the 10-16 Storm to the eighth and final playoff spot over Chicago and Atlanta, both also 10-16. Seattle has eight games remaining to claim a playoff spot, starting with the road-trip capper against Phoenix on Saturday night.